It is like a holy forest, Carlo told us. 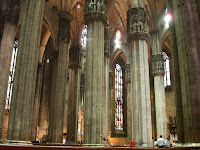 The design of the Duomo in Milan is more northern, more gothic than its counterparts I have seen in Florence and Turin. There a more Romanesque style greets you—astonishing in Florence, as you emerge from narrow Renaissance streets onto a piazza where the cathedral greets you with not only its beauty but its imposing size, which you encounter like some divine manifestation. 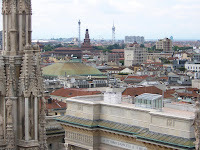 The approach to Milan’s Duomo is more like that to Turin’s, where you see the cathedral from a distance, like a pilgrim might have seen it in the past, and the approach to it sets your thoughts on holy ground. In the holy forest. In comparison with the cathedrals of Florence and Turin, the stone of this church is pale, almost white. The movement of its architecture is highly vertical: its spires twist like ascending tree boles or descending vines, and this before Carlo had provided the metaphor. 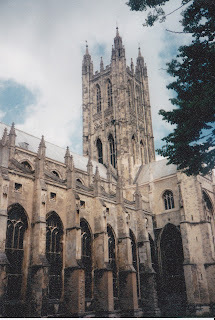 I had always been told that the medieval cathedral was an imitation of the city of God presented in the Book of the Apocalypse (or the Book of Revelations). To think of it as a forest is to draw from a whole new series of associations. There were things I noticed (and things I didn’t) that the forest metaphor went a distance in explaining. The vault of the cathedral, extraordinarily high, is like a canopy of trees, and this instantly made me think of Lorien in Tolkien’s Lord of the Rings. 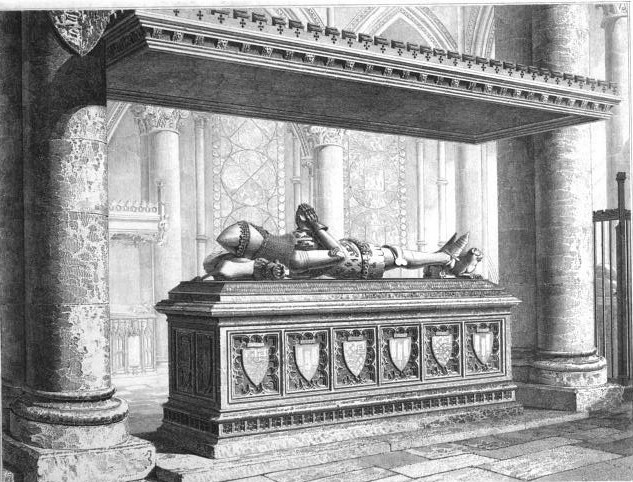 Furthermore, as Carlo was to explain, the columns of the cathedral were not equidistant, their disproportion accomplishing two things: the irregularity was about movement more than stasis, the columns’ asymmetry is not apparent unless you go in looking for it, and the slightest disproportions are used to guide the pilgrim’s or worshiper’s eye subliminally toward the altar. Moreover, it recalls the medieval comparison of earthly life to travel through the wilderness (remember, that’s where Dante starts in The Divine Comedy), but this is a wilderness transformed, shot through with the prismatic light of God, through which its particular and small imperfections are made perfect in the whole of the design, much as (I am guessing) the intentional “flaws” in Japanese pottery reflect how natural things are skewed in particular, but amount to an overall sense of coherence and wholeness. And so it reminded me of Lorien. How the Fellowship had endured much already, wanderings in inclement weather and over terrain that ended up being impassable—ended up sending them on the dangerous journey through the Mines of Moria, through battle with their enemies and the loss (apparently final to their despairing eyes) of their leader Gandalf. It was in Lorien, in a holy and still forest, that they were harbored, nurtured, and redirected. And that, to me, is the heart’s core of things. To harbor and nurture and redirect. Tolkien’s work is my most loved book, as most of you know, and it is the book that, in ways, defined my spiritual posture toward the world. Lorien was a place in The Fellowship that resonated with me, that was curiously more my idea of heaven than the versions the church had taught me in preceding years. Lorien was a readying for more adventure: it was not a stasis alone, but a readying for more of the quest. 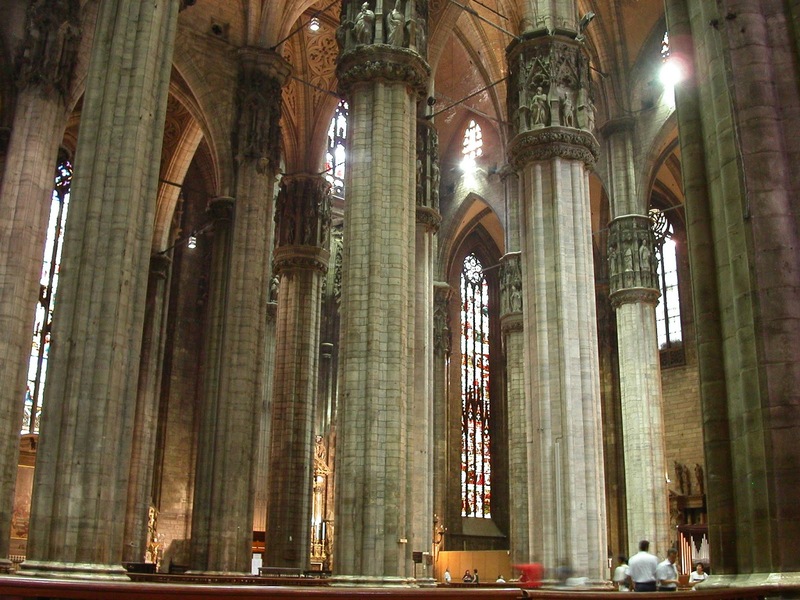 The pillars were asymmetrical there, and its colonnades, like those in the Duomo, suggested at movement. An idea of heaven that I like in this moment on earth: I’d like to be at rest and also headed somewhere, and though the eventual goal may be a more absolute stasis, the journey and the beauties and perils it holds seem like a heaven I’d set my sights on. My friend Carlo is Milanese, his family going back for generations in that impressive city. We were lucky to have him as a guide on a Sunday this late spring, when it was a day of churches and sights ranging from the picturesque to the breathtaking. As the second largest city in Italy, Milan sprawls like its North American counterparts. It feels in ways more “modern” than Rome. Its business and fashion centrality may account in some ways for the stylish dress and the astonishing physical beauty of many of the young adults I saw as Carlo steered us through the streets of the central city. Indeed, the first encounter with things Milanese had been before we were reunited with our friends: we had shared a train compartment with two young Israeli women, one civil and polite, the other model-lovely and absolutely refusing to shift her entourage of luggage so that we could fit comfortably in our seats. Things moved uphill from that rude introduction, which took place, granted, before our arrival, and frankly had little to do with the graciousness and hospitality that Carlo and his family would show us. I believe, though, that there is a kind of heartlessness to beauty and wealth, and perhaps we admire them both because something in us is ready to acknowledge that both beauty and wealth are all too willing to exclude us. But maybe this was a lens through which I unfairly glimpsed Milan now and then, born out of reading and film and popular culture, because our welcome was warm, with good food, good wine, and the humor of one of the wittiest of my friends. Wit, by the way, can have about it a whiff of heartlessness, too—an odd part of its attraction, I think. There’s a cruelty, for example, in a number of Wilde’s more brilliant observations that makes us gasp and laugh at the same time, and part of the laughter comes from the fact that we have gasped and caught the mean streak in the comedy. But wit becomes amiable and benign—becomes gracious and graceful—when it is generous while remaining sharp, and appreciative of the same qualities in others. That is a European wit at its best: in America there’s an edge of one-up, of the cutting remark made by someone running with scissors. But none of that was at our dinner table that night in Milan: Carlo is impossible to keep up with in matters of wit, but he makes you feel entirely at home when you make the effort. Bear with me. I am not simply praising a friendship. 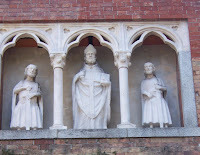 I have something to say that applies to the Basilica San’Ambrogio. A convivial night turned into a morning that was brisk but not hectic. We hopped a bus that took us into the center of the old city, where we attended Mass at this Basilica, a 12th century church that sits comfortably with the Roman structures acknowledged from its foundation (after all, the city was the Roman Mediolanum after it passed from Celtic hands, and the ruins underlie the medieval and Renaissance plan of the town). Part of the genius, I think, of medieval Christianity lies in those moments when it looks the Classical tradition square in the face and does not forget its beauty and its humanized scale. The church’s arcade is like something out of Rome, and directly outside of the cloister is the Colonna del Diavolo—the Devil’s Column. re, lodged in the stone when his diabolical horns pierced it. It was further believed that you could smell sulfur coming from the holes, and Carlo told us that if you placed your ear against the column, you could hear the sounds that emanated from hell itself. Which was why you see Rhonda listening at the column, because her faith and goodness of heart would be proof against infernal influence. I, on the other hand, stood at some distance beside Carlo, and though one of the principal Milanese tourist sites observes laconically that The holes that were once present have been recently filled in, I wouldn’t trust that all the ways to hell are sealed. 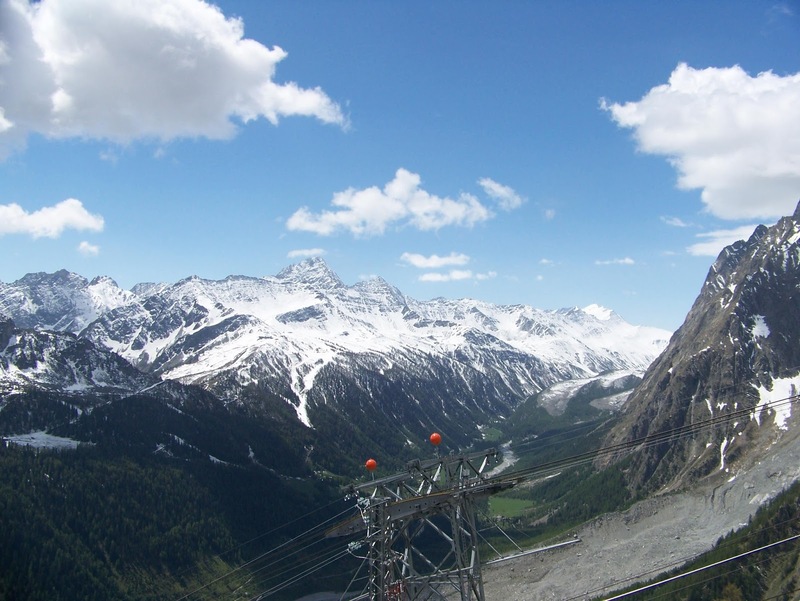 The first time we went to Courmayeur ended, to be honest, in a number of disappointments. The little village near the base of Mont Blanc was, at least on the Italian side of the mountain, the point from which you could ascend the famous mountain—at least high up its slope—by funicular. It was a promising prospect, but the first time we went there, back in May 2014, we were waylaid by the ATM machine. Italy is a country where the commerce of shops and restaurants is less…credit-intensive than at home. And though, as we were to discover later, the people who ran the funicular up the side of the mountain were more than willing to accept VISA, our way from Courmayeur to La Palud where the lift began was a good 4 km away by a bus that was cash only. So we had reached the end of our road for the day, quite literally. for a few hours’ lingering. Since this was a Sunday, and since it was the middle of May, two weeks or so past the end to Courmayeur’s principal tourist season, we were a little out of luck even in falling back on traditional touristry: half of the shops were closed, and a number of the more interesting regional restaurants didn’t keep Sunday hours. Lunch ended up as pizza, which I seldom mind, especially in Italy, but the one I order included a raw egg as one of the toppings—something more interesting to see than to think about or eat, and a reminder to me that a very rudimentary grasp of the language is occasionally not enough when you’re trying to negotiate a menu. But it was right before we went home that our financial inconvenience became a little more than just inconvenient. Became, in fact, embarrassing. Rhonda wasn’t feeling that good, so we stopped in a little café for some pastry and coffee. The snack served and finished, I discovered to my dismay that the place didn’t accept credit cards, either. A stumbling explanation in bad Italian brought out a manager—a young man name Luca—whose English and generosity were more than my ignorance deserved that afternoon. In short, we had the coffee and pastry gratis, and I would remember his kindness in the coming year, starting from the moment our bus headed back to Aosta, on board two passengers defeated at the low levels of global finance by inexperience and bad luck. Headed to Courmayeur this morning, then an ascent of Mont Blanc. No, not with piton and rope, but in safe vehicles in which you can stop for coffee at dizzying heights. My kind of adventure these days. So much of my prediction was (once again) wrong. Which calls for a little commentary, beyond simply advising other travelers never to predict how the day will go. “Safe vehicles” was, I believe, more or less accurate. The funicular turned out to be less like the stately one we had ridden in Ljubljana roughly a year before: shaky with bumps and scrapes, crowded with German skiers (and their skis), but all in all not death-defying, so yes, that would pass for “safe”. And “stopping for coffee at dizzying heights” was true as well—perhaps even better, in that we had lunch with a view at a place called Summit 3842, where excellent polenta made amends for sausage that was so-so, and the view, though intermittent because of cloud and mist, ended up trumping it all. It was what lay in between that I hadn’t bargained on. 228 stairs, straight up and steep, no landings on which to lean or even collapse. Even the skiers around us were panting. 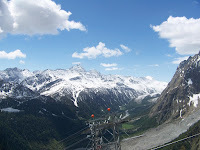 It was my daily workout—perhaps my weekly one—and reaching the top, winded and sweaty, I had to allow that the food up there tasted better for the exertion, the view more beautiful because it was earned. It was a couch-potato version of my own Mont Blanc climb, and laugh at me if you will, I was still able to make my climb without aid of piton or Sherpa. All natural drama and cataract and grandeur. Extraordinary beauty made even more beautiful because it’s on a scale where we don’t figure in. Indifferent Nature , the world before us and after us. A kind of curious face to face with the Romantic Sublime—Edmund Burke and all that bunch, and knowing that our footprint is so light upon the mountains that they would be indifferent to our feelings of smallness and of insignificance. 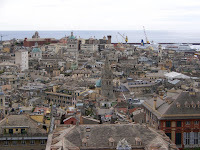 Something about port towns asks for a different aesthetic, and Genoa demands its own terms entirely. 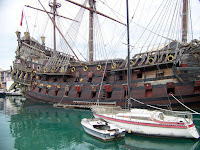 Its harbor widens into the Mediterranean, of course, and its place by the sea has almost entirely dominated its history. The Genoese were famous as navigators and sailors, and their banking and financial community rivaled that of Venice, their neighbor and rival on the other side of Italy. 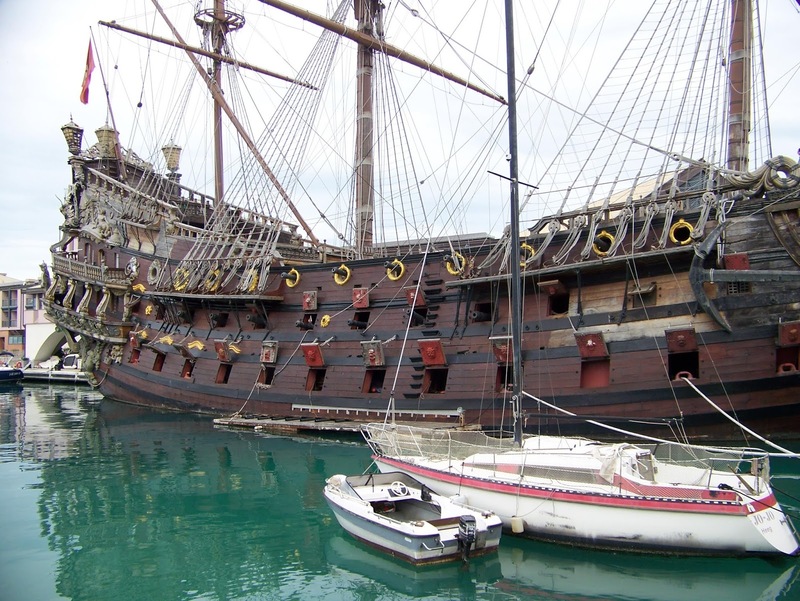 Going to Genoa would prove to be a great adventure, because for once I had no idea of what would greet me. My images of other Italian cities I have visited—of course Rome and Florence, but also Turin and Milan and Venice—had been shaped beforehand by the things I had read, but Genoa was fresh to me; I knew the salami and Christopher Columbus, but little else. We got off the train at Genoa Piazza Principe, the main station in the town. It was built in the mid-nineteenth century, and it was only upon our return that I would get a good glimpse of its exterior—marbled and squat and beautifully sturdy, as though somehow solidity counted for a unique beauty in this decaying city. Our hosts Anna and Carlo met us right off the train: Anna dear to us for some time, Carlo her boyfriend soon to be a welcome addition to our circle of friends. We walked immediately into the heart of the town, and almost as immediately, I felt that it was unlike the other Italian cities I had visited. The city slopes up from its harbor at the same steep angles I had seen before in San Francisco and in Wellington, New Zealand. But the age makes a difference: Wellington, though set on perhaps the steepest incline, is a sloping city of parks and open spaces, and San Francisco has a certain consistency of architecture, all its beauty residing in its nineteenth-century buildings and its gracious pact between Victorian charm and modernity. Genoa is quite a different character. Yes, it has some of the alluring seediness of a place like Venice—another city that gathered its power and reputation through sea commerce, from medieval times to the present. But if you were to liken the two cities to, say, a pair of old courtesans, still shimmering in rich decay, Venice would be the one who had better preserved her looks, either through cosmetics or some lucky genetic gift. But Genoa was far and away the one who was better company, filled with good stories and shady transactions. The streets of this city bristled with a canny, subversive life, and today it was overcast, the rain imminent. Right from the start I saw the street vendors—not unusual in any Italian city, but more prevalent here, and perhaps more aggressive. There were a number of Africans, migrants from what were no doubt desperate circumstances on that troubled continent, selling bead bracelets and small, cheaply carved animals. There were also the Romani (Americans generally know them as “gypsies,” a term most of them resent); and then, quite common, the native Italian beggars, who migrate from table to table at the cafes, pleading insistently (and sometimes at great length). Our friend Carlo, who seemed a calmly quiet young man, refused one beggar again and again, and yet again as we had coffee in a Genoan piazza. I could see that, eventually, even his extensive patience was taxed, and I wondered how porous the “safety net” might be Italy, since a whole subterranean world seems built on a kind of drifter culture, especially in the slow, seedy climate of the port town. It wasn’t long until, almost reluctantly, we were shown the statue. 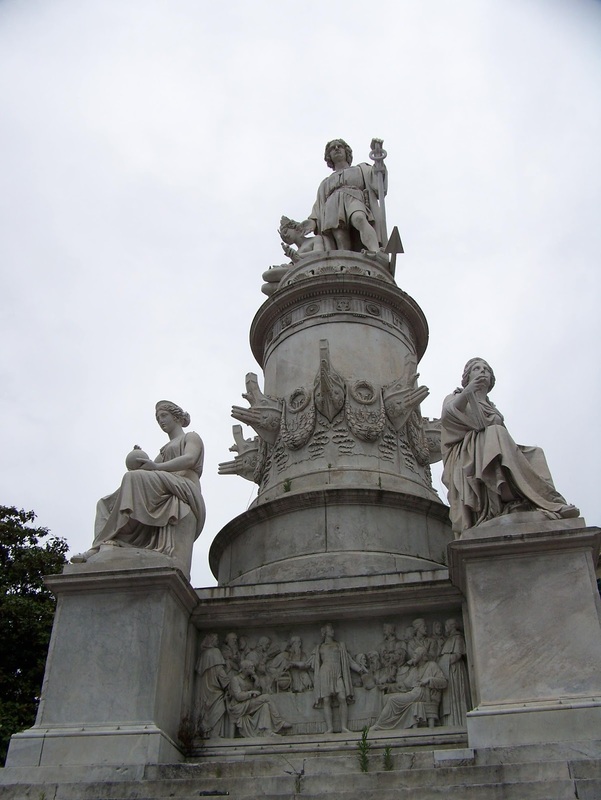 Christopher Columbus was honored rather late in Genoese history, with the monument erected roughly 150 years ago. A deeply romanticized portrait, Columbus like someone out of a Byronic poem, his hand resting on a “subdued Indian maiden,” as some descriptions would have it. The sight was uncomfortable, and when you put it together with the street-vending refugees and vagabonds, you couldn’t help thinking that it all tied together ultimately—that the glamour of the city had kept its shifty undercurrent for centuries, and where other cities had found ways to make street life less visible, Genoa had kept it in a noticeable tension somehow as part of the picture. It was a city that showed you the shadier side of the mercantile and capitalist economies in its balance with beautiful palaces and architecture. Where American mythology would blame the beggars, and where the Left would blame the dukes in the palaces, Genoa set the whole picture before you with an Italian shrug: è quello che è, or “it is what it is”—a maddening, cliché phrase to the American ear, but particularly apt in this complex city. 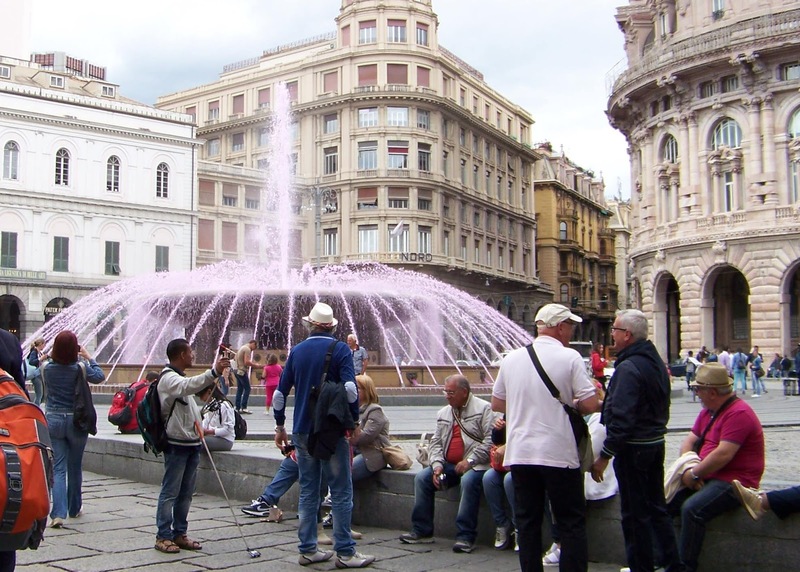 To please the tourists, the powers that be had dyed pink the water of the fountain at the Piazza Ferrari. Anna and Carlo were mildly horrified, I think, by what was certainly a gilding of the urban lily, but we, of course, were those tourists in question, sucked in by the coat of paint, and also with little girls waiting at home, whose favorite colors were pink and purple. So we took the photograph. And it was only later that it occurred to me how this publicity stunt brushed against the edges of marketing—presented a place in a manufactured prettiness, when its real beauty lay in something more harsh and compromised and durable. “Are you shocked?” Anna would ask me later, as we passed through a narrow, Renaissance alley on our way to her flat. The dark, cramped passage was the haunt of Genoese prostitutes. Prostitution is open in Genoa, although technically illegal: the women work the daylight hours, standing in little alcoves off the alleys and the older, narrower streets. Indeed, there was little to shock in the arrangement, unless it was how policy conflicted with practice. Again, the city’s conflict between a nebulous idea (perhaps put forth in generations of advertising and tourism committees) and the essential heart and spirit of the city, rougher than any travel guide and yet alluring, an unabashed, unsentimental landscape in a long Italian history of maritime commerce. I would imagine that in our time, with the exceptions of Rome and Jerusalem, Turin has become the most frequent destination of the Christian pilgrim. 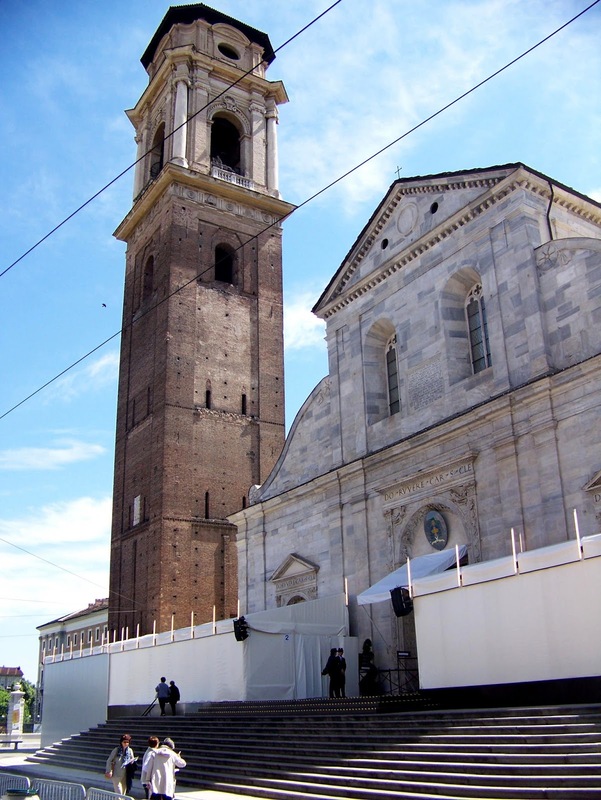 After all, it is the Duomo of Turin, the Cattedrale di San Giovanni Battista that holds the famous Shroud. And for Rhonda, and a little bit for me, we found ourselves moved in the middle of May on a pilgrimage of sorts, to view an artifact that I doubt and that she thinks might be. Yes, there are nuances and details, spaces between my skepticism and her entertaining possibilities. She’s a good Catholic girl, and I am one of those people not hardwired for belief, but this would have something to do with the both of us, we figured, so we left Turin’s Porta Susa—a long and horizontal (and disappointingly immaculate) train station in the western part of the city, bound for the cathedral by a meandering city bus. Perhaps on trips like this, the pilgrim attunes his mind to approaches. Perhaps it was why the passengers on the bus volunteered to locate our stop for us, an older man signaling well beforehand the prossima fermata virtually in front of the Duomo. As always, a simple and benign prego to our thanks, the helpful and genuine friendliness of everyone we encountered from the train station to the presence of the Shroud a testament to civility at the least, to the courtesy of this solid and open city. Turin struck my imagination as a city of piazzas and colonnades. Of course, you could say the same of many of the large Italian cities, but somehow in Turin this arrangement called attention to itself, nowhere so strikingly as around the Duomo. There sat the major cathedral of the city, San Giovanni Batista, blockish and externally plain when compared with its counterparts in Florence and Milan, tented and scaffolded in parts by the continual reconstruction you see around the monuments of this country. Hugging a brick wall to our right, we walked a block or so and turned right, as we had been guided, toward the Giardini Real, the expansive park that abuts the cathedral and the Palazzo Real, the grand palace of the city. It was here that the pilgrimage began in full, and the shops lining the streets—not simply the cramped, provisional booths selling photographs and wall-hangings of the Shroud (and even, on one occasion, a splendidly blasphemous dish towel), but also more respectable shops, it seemed, their wares a bit more permanent and a lot more expensive. This was the stuff of medieval pilgrimage, where like the 1st century Temple in Jerusalem itself, part of the space was ceded to Mammon. This mercenary part of the journey didn’t bother me. Perhaps it was my cynicism, in full flourish since we had learned that the Shroud itself, not its replica double, would be on display this summer in Italy. At the time we discovered this, I remember thinking, “And the difference is…?” Because it makes no difference if the original Shroud is not the Shroud, I thought. What, after all, could distinguish one version from another when both are images of some imagined thing, a representation of a collective desire for something to be more than it is? We had been told to expect hours of waiting. The day was warm, and the prospect seemed miserable to me, as the one thing I hate more than lines is hot weather, but as we passed through a friendly but thorough security check and into a tented walkway, the temperature was not unpleasant and we seemed to be moving at an unanticipated pace. All around us were languages we did not speak: I hear Italian, of course, but French and German as well. I heard the recognizable inflections of American English, but missed the words in our surprisingly swift movement in the queue. Toward the dark lands we hastened, now being divided into small groups. I clung to Rhonda out of the silly fear that the ushers would somehow divide us, and we would enter the presence of the Shroud separately, losing each other in the crowded shadows. Fortunately, nothing like that was remotely possible, and we entered the cool dank air of the Duomo and were guided to a long, illumined display that I first mistook for the Shroud itself until, on closer approach, it was evident that what stood in front of us was a photograph. 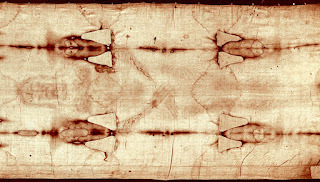 A display in several languages described the Shroud for us, pointing out—almost like a lecturer’s highlighting, complete with pointer and magnified slides, the visual evidence marshalled for a crucified body, lacerated and pierced in the hands, feet, and side. When you knew where to look, you were prepared for the viewing. Even the pastries are filled with diamonds. Into the hushed darkness we were guided, cautioned against flash photography, of course (sh the attached picture of the Shroud is not my own). This attention to protocol intensified the shadow, made it a place outside of place, the courteous whispers of elderly ladies arranging us in rows and tiers before the famous artifact. I thought of Rudolf Otto’s famous definition of the numinous: mysterium tremendum et fascinans. The idea of the holy as mysterious, inspiring fear or awe and yet drawing in or attracting the beholder, and doing both at the same time. Beyond a ranging curiosity, seeing something that you owe it to yourself to see if it is on display, I confess to having no sense of the numinous on the fabric. Yet in the hush of the room, the devotion was palpable: what these fifty people or so had carried with them from the reaches of the city, the continent, perhaps the world. To some, this was the grail at the end of a journey, and to say, as has become customary, that it was the journey that mattered more than the arrival—well, that’s presumptuous, to tell this assembly of the devoted what meaning they were to gather in the presence of the Shroud and, even more presumptuously, how they were to gather it. As for me, I needed no artifact to notice that the quiet around me was welcoming, that unlike the religion I have often encountered in my experience of coming up, of my struggles with a faith in the fifty years before I sat it aside at last, this was a quiet that beckoned me in with no agenda and a simple, abiding silence. It seemed like a place at the table I might have taken had it been offered, or had I seen it, years ago. Note: This to be used as the head of a section to a proposed book of travel writings. There’s a quote from Baudelaire I’ve always found funny: apparently, when asked why he didn’r write any nature poetry, his answer was simple and direct: “I don’t worship vegetables.” Just the right amount of bluntness and smart-assery that reveals a genuine creature of the city. The city is, for many of us, the landscape of record. I didn’t grow up where that was the case: my two principal childhood homes were suburban and country, and the circles of my travels seem to take me back to small towns—places of mixed blessings that seem to be where I settle, as a rule. But I believe the city is the arena in which the drama and situations of the 21st century inevitably take place, and I believe there is nothing particularly fresh or insightful in saying that. As far as I know, the city became the center of the Modern soul about the time it became a character in imaginative literature. For all the Romantics’ infatuation with Nature, you have old Willie Blake writing Songs of Innocence and Experience in the height of their heyday, and you can’t imagine those poems outside an urban setting. The city pervades them, even the crazy visionary stuff, but “London” and the Chimney Sweep poems are shot through with the dirt and noise and claustrophobia that would enter our imaginations for the next two centuries. There’s Dickens, and Baudelaire like I mentioned. And Joyce, and Eliot, and Kafka. Yes, lots of writers tried to get out of town, but so many stories begin and end in the city these days: we are condensed, overpopulated, forced to live and die in the presence of each other. But it isn’t as bleak as that. In Milan only a week ago, I again brushed against the ideas of the Italian Futurists—Marinetti and Boccioni and their celebration of the art of machinery and noise and combustion. Too bad some of them filtered that passion into Fascism, because they were certainly on to something in the human spirit. We love the new, the brilliant and violent. We love the crash and clamor of things, especially when we’re young, but in my case some of the affections lingered into middle age, so here I am—part of me Futurist, while another part romances the past and the layers of cities. And as character in modern fiction, cities in modern times take on personality. You get to know them gradually: at first they are mysteries, broad stereotypes of what you have sometimes heard, perhaps. 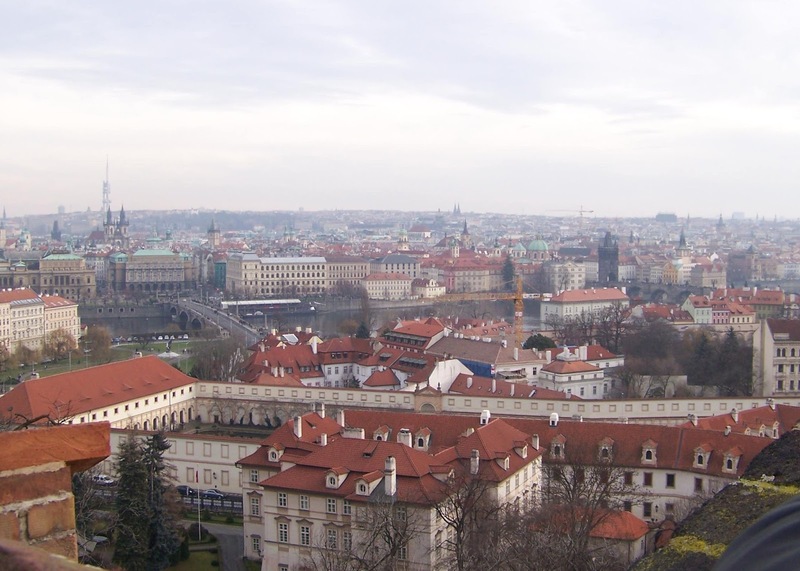 For me, the cities often take shape through what I have read: I cannot imagine Prague, for example, other than through the lens of Franz Kafka, although in doing so, I no doubt miss the city on a number of levels. As it reveals itself through exceptions to type, the city unfolds slowly and with nuance, like Molly Bloom or Quentin Compson, and you acquaint yourself in stages, learning streets and districts and skylines as you might countenance and expression. So this entry is intended to head up a section of my travel writings called Visible Cities. The homage is obvious: Calvino’s book Invisible Cities is one of the most beautiful things written in the 20th century, and I owe him much more than a title. Calvino’s cities were drawn as rich prose poems, fantasies on ideas and on the way we organize, construct, and give meaning to the raw materials around us. No wonder he used the city: it is always a chaos almost always struggling to become something: experts on chaos theory (of which I am certainly not one) claim that it is the only way to explain the traffic patterns of cities, and since that assertion requires a knowledge of physics above my pay grade, I will just assume they have a point, and that the city’s disorder was a kind of vehicle for larger, more conceptual orders that Calvino managed to discover in its parts and unruly complications.